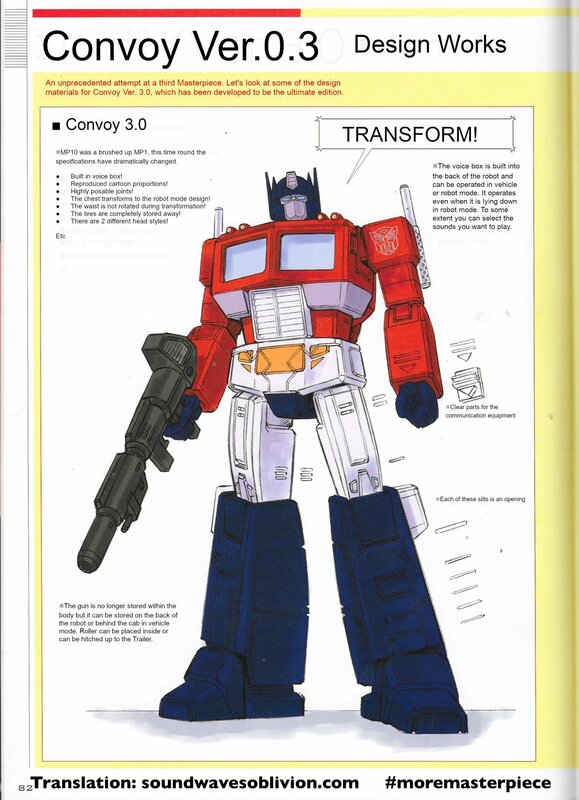 Care of soundwavesoblivion.com, we can share for you a proper translation of the Transformers Generations Book 2019 MP-44 Optimus Prime Article. 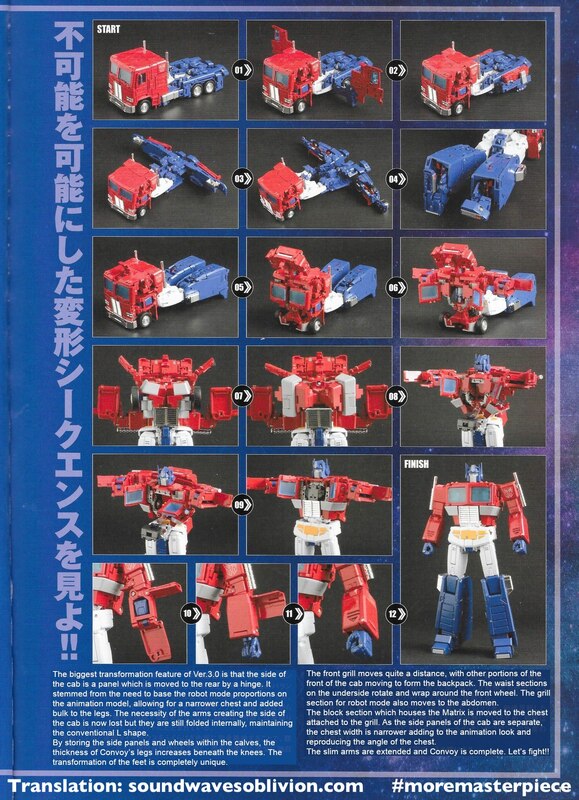 We have 8 translated pages from the Transformers Generations book 2019 dedicated to the latest Masterpiece incarnation of Optimus Prime. 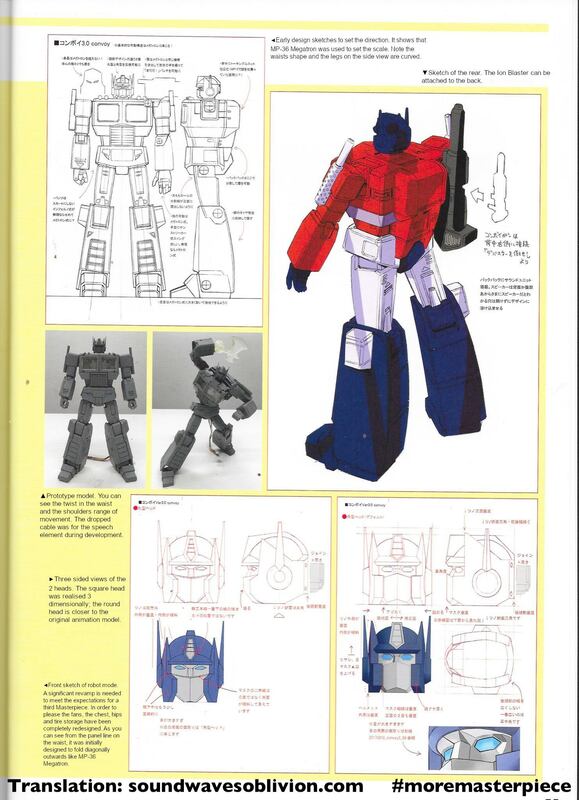 Four pages dedicated to the toy itself plus gimmicks and accessories, and 4 more pages with early sketches, prototypes and details of the production process. A worth reading indeed for fans and collectors. Check out the images attached to this news post and then sound off on the 2005 Boards! Am I the only person who is more excited for a Bumblebee Movie Optimus Prime Masterpiece figure? Since, that figure would most likely only be around $160, because for some reason, the 8.5/10 Studio Series figure has me very impressed, without it being a Masterpiece figure. I can\'t tell wether it\'s better or not than the Siege Prime, who is also a fantastic figure. I\'ve just been iching to get the Studio Series figure, but have just been thinking about the (hopefully) inevitable Masterpiece figure. MORE excited? Nope? Excited? Sure! 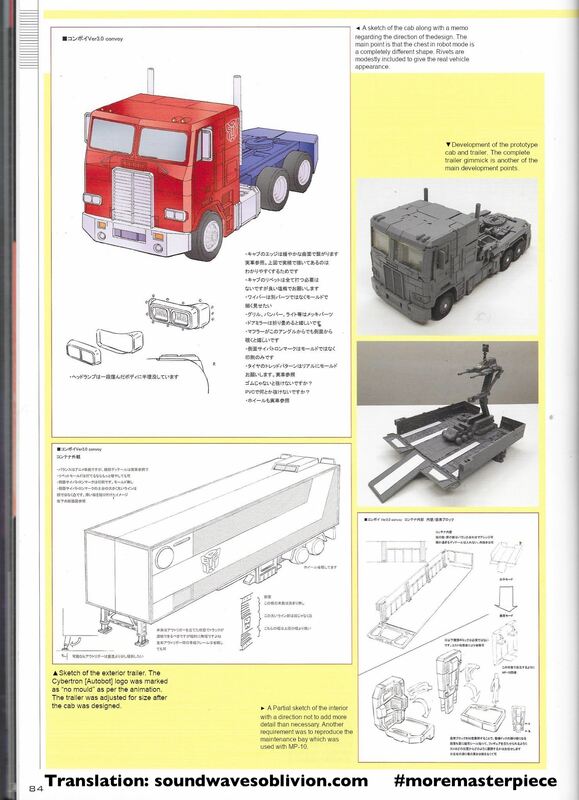 It’s a great design, and it pretty much 100% will be made into an MPM because it’s Optimus Prime. I wouldn’t be surprised to see it be MPM-10. You rang sir? Here is the toy head version followed by the S2 head version. *Drools* I won't be able to afford to double dip personally. But they NEED to do this. I bet they will. The bicep line looks almost like a pretool for it lol. Ah thanks! 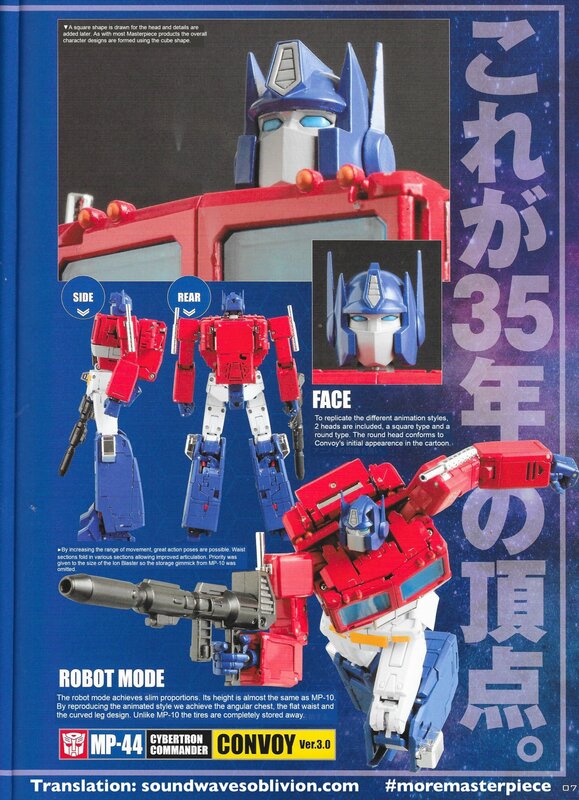 I'm probably not going to be able to afford it either, especially because I think if I had this I would HAVE to have MP-36+ also But I think based on how they did 36+, there's not a lot of wiggle room for how 44+ would look, it would have to be pretty close to this right? … I know @Dean ML will agree, William Johnson's excellent art work on Ratchet's first solo story arc in the issues 'Warrior School' and 'Repeat Performance'. I definitely DO agree! Johnson's all-too-brief two issue run (along with legendary genius Kyle Baker) might've been the best of all of G1 comic book art. Gorgeous stuff! I really hope we get a mp44+ toy deco. IDK why but I think the yellow eyes set in black on that head sculpt would look striking. 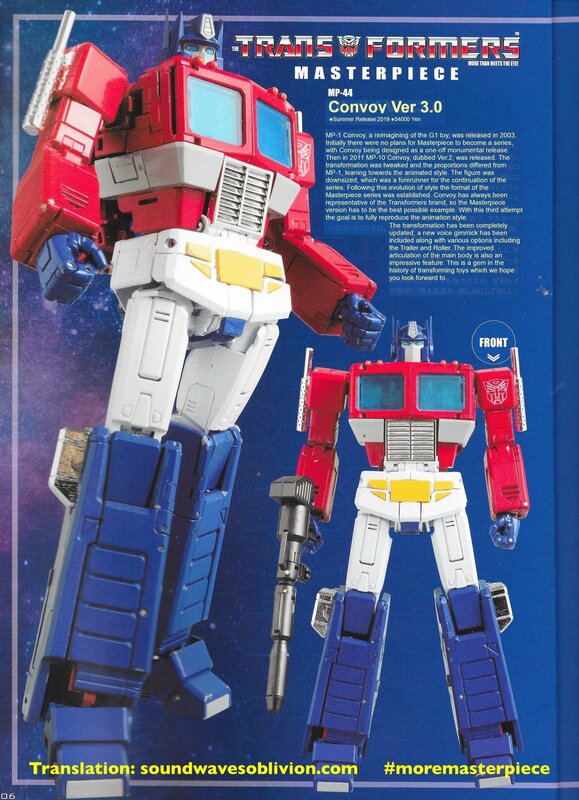 Yup, although he'd come with a brand new cartoon accurate head, he'd probably also come with the regular two heads (same as MP-36+) with yellow eyes (although I imagine set in toy-accurate blue/purple). 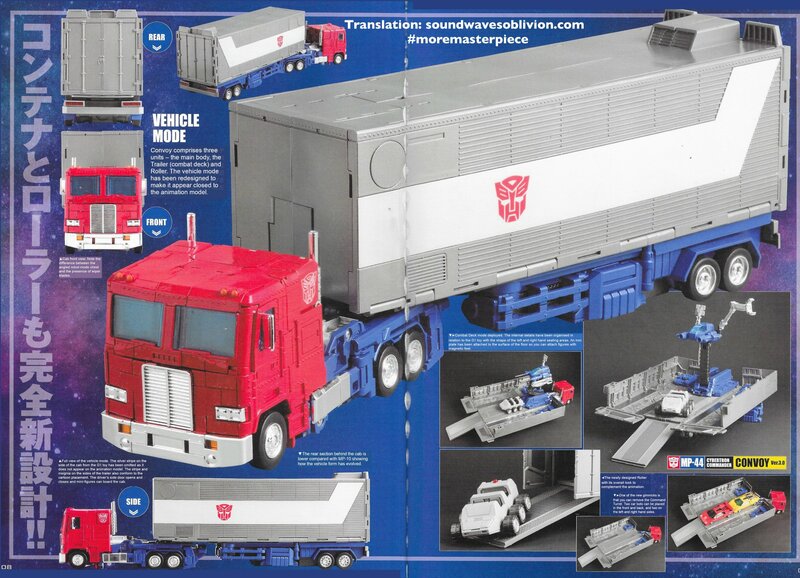 Think @chchchch did a digibash of how that would look too. I think what could be pretty neat, is if this releases, and the KO/Third Party engine basically creates a version of this that keeps the improved articulation and engineering, but makes the aesthetic and details more in-line with the older stuff; silver leg vents, rounder head, the works. Sort of a 'best of both worlds' approach for those who aren't so fond of the cartoon-accurate but oversimplified deco. In response to all of the above, and others I didn't quote – I am certainly speaking for myself. Apologies for the scope in my suggesting that EVERY 80's kid felt the same. That being said, you guys don't remember at least hearing that opinion about Skyfire or Megatron's head? I suppose if you watched the show first, you'd want the toys to look like them. But I was introduced to the toys first and then started watching Sunbow. Well, I *did* definitely love the Jetfire (Macross) toy and lusted after that damn thing for months but never owned it. On the other hand, I thought Skyfire looked equally bitchin on the show. I had Megatron, though, and I definitely pretended he looked like the cartoon through the filter of my imagination. But now thanks to MP-36 I don't have to! Even possibly my most favorite G1 toy, Galvatron, always looked wrong to me. I'd kill for a purple MP Galvatron! For the record I am definitely the kid @W-P38 is talking about. We didn't have cable so I was always behind on new toons, and got into the comic with #5(No they can't be dead, I just got them! ) but I had Soundwave and Buzzsaw, Mirage, Thundercracker and Sunstreaker by the end of the first year, Prime, Megatron, Ratchet and the remaining Mini-bots and Cassettes by the following summer. And I chose Ratchet, he wasn't a surprise gift. I needed a medic for my team and I loved his and Ironhide's unique look so home he came and I loved him until he was stolen from my backpack in grade five. I don't remember being super concerned that they looked different in the Comic and Toon and as an adult I can understand from an animation standpoint why they made their designs less interesting, but the whole Jetfire/Skyfire thing was definitely a topic of heated playground discussion, 99.999% of which was pure BS. What did kids know about toy licences and intellectual rights? But I also saw how different everyone else's model was as well. Jets sans tailfins in bot mode, no Mega-crotch, faces instead of faceplates, proportions that don't exist on the toy, etc. So I just rolled with the changes, made easier by, and I know @Dean ML will agree, William Johnson's excellent art work on Ratchet's first solo story arc in the issues 'Warrior School' and 'Repeat Performance'. Just look at the image at the top of Marvel Ratchet's TFWiki page and tell me that's not frighteningly prescient of MP Ratchet's transformation. Witchcraft! But excellent artwork and stories aside both G1 Ratchet and Ironhide have the most boring, generic body types this side of a Reflector drone. I still consider it a loss that they didn't even try to depict them honestly. Funny thing is I'm still rolling with the changes, and for pretty much the same reason. I just love Transformers toys and regardless of source be it G1 Toy ,Toon, or Comic, an MP Transformer is still a Transformer toy. 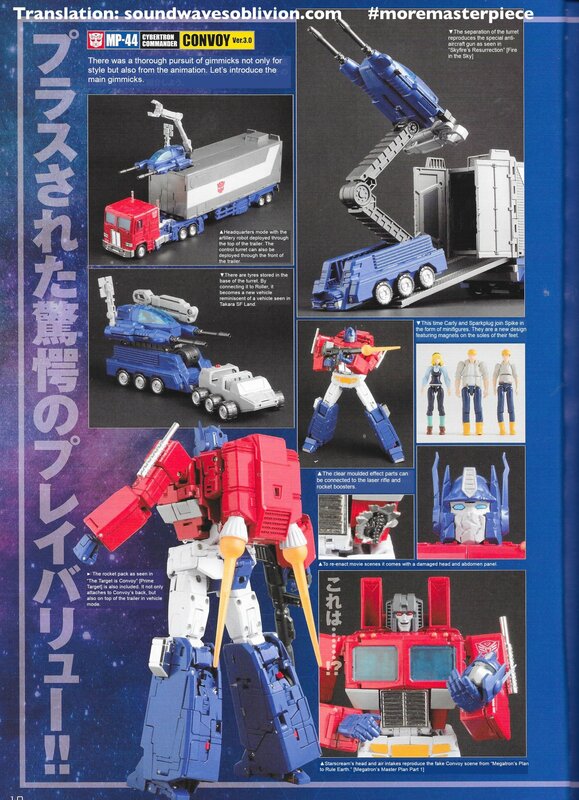 I'm not buying MP-44 because it's more Toon accurate, I'm buying it because it's going to be the best damn Optimus Prime toy. Having a unified aesthetic is less important to me than just enjoying the journey from action figure robot to thingamajig. But as soon as I can afford it I'm buying doubles of Ratchet and Ironhide to put in that headless fan mode. And probably a third Ratchet since I doubt he'll get an X release like Grimlock. I love the + Series but X needs a comeback. Speak for yourself, brother – it was the complete opposite for me and my friends back then! In fact, I didn't see the toys in store until the end of '84, months after I'd already fallen in love with the show. I was so excited to finally see them in stores but then immediately had a sense of disappointment as so many of them barely had a passing resemblance to the characters I watched after school every day. It's the main reason I didn't jump into TF toys until a year later when I finally got one as a gift. The MP line is now exactly what I've dreamed of and more since the fall of 1984. Amen brother! I'm not going to mention Ironhide and Ratchet, except that no one I knew bought them… I was especially disappointed by the heads of the various characters. Bumblebee's head looked nothing like him for example. Why couldn't they make the toy look like the cartoon? I just didn't understand. Now I know that the toys already existed and that really the cartoon was "wrong". All I wanted was for the toys to look more like the cartoon. Even as a little boy I already wanted the toys to scale better together. And now we're getting exactly that! It's like the cartoon coming to life, after all these years! Sounds like you were a very unusual 80's kid with a very unusual group of friends. You only have to look at the differences in 'likes' between your post and @Dean ML's rebuttal to see the overwelming concensus among fans (80's kids or not) is that they wanted the toys to better match the show. So your sweeping statement just doesn't hold true. That said I do think it totally depends on how you were introduced to the franchise, toys first or show first? More access to the show or comics? What toys, episodes or issues did you have experience of? I'm an '80's Kid' in so much as I was 6 when Transformers came out and followed the franchise all the way through to Action Masters (coincidentally The first attempt at increased show accuracy). Here in the UK I'm fairly certain we saw the toys before the show and my experience was the comics were more readily available than the show. So my experience and that of my friends was not that one that versio. Trumped the other only that the disconnect between them was a bit jarring/confusing. There was a lack of synergy early on…which as kids we just rolled with…I'd argue it's more of an adult concern to have everything match one another. Agreed, it's a rather unique point of view. Everyone of my friends who grew up during G1 regardless of their point of reference prefered the van bros more humanoid iteration. I totally get the Jetfire thing though. Macross didn't really make it over the the UK (at least not in a big way) so we had no idea where he'd come from, just that he looked cool as hell! I certainly envied my brother for having one. I feel exactly the same way, sadly the line has moved on and left people like you and I behind. Thankfully Beast Wars MP's came along just at the right time to divert my attention away from the increasingly less appealing G1 offerings. Although they exhibit the same slavish comintment to a show accuracy that actually suits my preference for the most part, due to there being less disparity between the different iterations or controversy as to what the ideal one is. There are few 'gaps' I'd like to fill in my G1 MP collection (which I'm finding I'm increasingly going to 3rd parties for) but once these are filled I think G1 will go on the back burner.